Whether you are a fitness buff or a complete exercise beginner, a treadmill can be a wise investment. But with the hundreds of companies out there selling treadmills, there is an array of options to choose from. In this article, I will discuss four of the most important items that you should look for, when shopping for a treadmill. When shopping for a treadmill, the most important consideration is the motor. The majority of treadmills operate on a DC electric motor that provides an easy to control electric current. Quality treadmills use a power output anywhere from 1.5 to 5 horse power (Hp). Obviously the larger Hp will be more expensive. If you are using your treadmill for your home and for only a few people, then 2 Hp is all you need. Since you will be doing your exercise entirely on the deck of the treadmill, it is very important that you find one that will fit your frame and provide comfort. Usually running decks on most treadmills come with two rollers on each end, which help operate the belt. The deck is generally composed a wooden or fibre board that provide some level of spring every time a foot impacts on it. Shock absorbance is important to preventing injury. When shopping for a deck you should primarily look for decks that can maximize the impact of your legs. In addition, look for at least a 60” length and 20” width. This will provide enough room for the average person’s running stride. If you are bigger, then you might need more room. Treadmill frames should be composed of a steel or aluminium material. Over time, these frames are known to be much more durable then plastic or wood frames. Durability is the key, so only select a frame that can take a pounding without breaking. The final factor to consider is the console. This is the one section where treadmill retailers overwhelm consumers with a bunch of jargon and cool sounding gadgets. Buying a treadmill can be confusing because of the technical terms and jargon. By understanding the basics of what you need, then you can ignore all the fancy sounding names and focus on what is important. When you understand the basics of a quality treadmill, then it will be easy to find one that is perfect for your home and budget. Online personal fitness training has become an affordable, convenient alternative to face-to-face personal training. The internet offers the ability to receive instruction from a qualified fitness trainer in the privacy of your home or office and even while traveling. The number of certified fitness trainers working with clients online has increased more than 400% in 2015 compared to 2016 and is predicted to double again in 2017/2018. The F85 also incorporates the largest deck that SOLE offers, an exceptional 22″ wide running surface that is comfortable for any runner. In fact, the F85 can handle users weighing up to 400 lbs. This model has up to six auto programs and two user-customized workouts. It also has two separate heart rate control programs. It’s fully equipped with all the programs and customization you’d expect. The heart-rate control option automatically calculates your recommended target range based on your age. So you can be assured of the most efficient and safest workout possible. The treadmill console is user friendly with a vibrant display that includes a message board for clear instruction and feedback. The information that is displayed at all times include Speed, Incline, Time, Distance Traveled, Calories, Pulse and Pace. There is also a 1/4 mile track feature and a Peak and Valley graph for different programs. Sole F85 treadmill may just be the best folding treadmill for runners with a powerful motor, extra long running surface and an impressive warranty that every runner always wanted. This quality machine is sold at reasonable price and back up with impressive 2 years warranty. I am highly recommended Sole F85 in my must buy list. Sole F85 Treadmill is sold together with a powerful strong motor capable of attaining speed 12mph. This speed is very effective to treadmill workouts. It can be inclined in different positions to reduce strain. Walking surface is about 22’ by 60” that eases running and maximum comfortability. Sole F85 treadmill is fitted with a Cushion Flex Deck which claims is an industry’s best deck that providing a 0.365 lower impact than walking or running on asphalt. This unique system offers stability for the user while providing minimal stress to hips, knees ankles and spine during running on it. In our testing, we scored quite high on this feature as we do feel the deck is soft and less impact on the joint. Deck is also in lifetime warranty. Sole F85 Treadmill is a good choice if you are willing to shell out a few more extra bucks. The Sole F85 Treadmill is the latest in the line of best-selling treadmills. 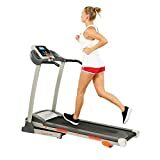 The treadmill offers everything that a serious runner or powerful walker could expect for an effective indoor training: a powerful motor, a spacious workout area, very nice cushioning and an automated incline. Elliptical trainers are a superior choice for many people. An elliptical provides a vigorous, aerobic workout comparable to jogging, but with far less stress on the joints. It works a wide variety of muscle groups, including your back, shoulders, chest, arms, and abdominals. All those muscles working at once means that the heart rate rises rapidly to the target range, the hallmark of an effective, efficient workout. And because it’s a weight-bearing activity, exercising on an elliptical trainer will build bone density. Elliptical trainers can give a complete body workout if the arms are also used. They are low impact cardio vascular workout machine and are easy on the joints of the legs and the knees. They help you to lose weight and stay in shape. In fact you burn the same number of calories as you would when you are jogging on the treadmill. For this reason, people of all age groups can use the elliptical trainers. Thus whether you are a beginner or an advanced athlete, you can easily work out on the elliptical trainer. In the more expensive models, some of the features included are warm up and cool down periods. This prevents the body from having cramps. Therefore when you look at look at the features and the cost of the elliptical trainers very closely, this helps to analyze which is the better elliptical trainer. It’s important to buy the elliptical-trainers from a reputed company that can also provide after sales service. Look at the warranty periods to ensure that you get the best deal when you buy the elliptical trainer. Normally there is one-year warranty for the labor and three year warranty for the machine parts. Lifetime warranties are possible and recommended if you find something in your price range. Compare treadmills and their features before making a decision. 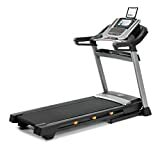 The number of features plus the fact that the prices of treadmills can range from about $500 all the way to $10,000 means that you must compare treadmills as much as possible. 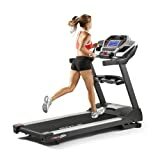 Some lower priced treadmills can actually have a better treadmill rating than some that cost thousands of dollars more. There are many things to consider before you buy any treadmill. Compare treadmills tip #1: Determine how much you are will to spend before you go shopping. As mentioned above, the cost of a treadmill can vary greatly. This is truly a case of you get what you paid for. You’ll find this true with any treadmill reviews you can find. The cheaper treadmills simply aren’t built to last. On the other hand you don’t have to rush out and do a treadmill comparison of only the most expensive treadmills. After all, in a lot of cases you’re only paying for the fancy add-ons and other gadgets. Compare treadmills tip #2: Check around. Don’t go to one location and buy right away. Compare treadmills at all of your local treadmill stores. Possibly the most overlooked place to purchase a treadmill is online. Online exercise equipment stores offer many more advantages over regular stores. Check as many of them out as well. When searching online try to locate some good exercise equipment reviews that will help you narrow down your search. Compare treadmills #3: What will you use it for? Before making any treadmill comparison you need to determine exactly what you will use it for. Will you be doing a casual walk now and then? Will you use it for a light jog each day? Or will you use it for intense running? The more you intend to use it, the more money you will have to pay. Most treadmills under $2000 cannot handle daily running. Compare treadmills tip #4: How much space do you have set aside in your home for your treadmill? This is one area that a lot of consumers overlook. Just where will you put that treadmill once you get it? Also, you will have to leave approximately 2 extra feet of space on all sides of it. If you are using your treadmill to run on or are a tall person, you will need a treadmill with a longer belt (the surface you run on). Running requires a longer stride so keep this in mind. Compare treadmills tip #5: Test before you buy. Regardless if a treadmill rating is high on certain models and not on others, test for yourself. Even if one model gets good treadmill reviews online, you still have to test it if at all possible. Most treadmills sold online will also be sold at exercise equipment stores. You have to determine if it will work for your unique situation regardless of what the online treadmill reviews say. Compare treadmills tip #6: Performance. When you test out any treadmill make sure you take note of how smooth it runs and how quiet it is. Treadmills with cheaper parts (but a high price tag) tend to make a lot of noise and vibrate somewhat. Compare treadmills tip #7: Warranty concerns. Check out the warranty in great detail. All manufactures are different. Most are quite different when it comes to the motor, the belt (the belt you run on), the frame and various options. A lot of the cheaper treadmills only offer a year or less on the belt. If the belt breaks after that, you can expect to pay an additional $500 or much more for a replacement. Compare treadmills tip #8: What safety features should you look for? Probably the biggest one is an emergency stop button. This is very helpful in case you slip and fall off the treadmill. You also have to determine if it will support your body weight. Some treadmills don’t support as much as you think. The last thing you want to have happen is for the treadmill frame to break when you have it on an incline or are running. You could get seriously injured. Compare treadmills tip #9: What top speed will you need. Most treadmills have different sized motors and therefore will run at different speeds. Make sure it can handle the speed you want to run at. So there are just a few points to keep in mind when buying a treadmill. It is a big financial decision, so do your homework ahead of time. 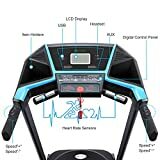 Read as many treadmill reviews or treadmill ratings as you can find. More then likely you have heard about an elliptical trainer.. You know what they are, you know what an elliptical trainer looks like, but how exactly does an elliptical trainer benefit you? Many people can look at a Elliptical trainer, but they really do not understand how an elliptical trainer can really benefit them. We will go over some key benefits of the many benefits that a elliptical trainer provides which will show you why they are becoming more popular then ever. The biggest benefit of an Elliptical trainer is the time you can save by using this machine. There are many people who lead extremely busy lives and do not have a great deal of free time to spend exercising and keep their body in good health. With an Elliptical trainer, you can eliminate the need to not only go to a gym to work out, but it will also eliminate the time, money and effort to join a gym. This machine is very convenient to use and it provides a full body workout in less then thirty minutes. This is very good news to hear for someone that has a very limited amount of time to schedule into their busy day for working out. Another key benefit of an Elliptical trainer is that they have very low impact and do not require any specific muscular skill. Low impact basically means that you have the lowest risk of obtaining an injury form using the machine for your workouts. This is very beneficial when you compare working out with weights and other fitness machines. A elliptical trainer also does not require you to perform strenuous positions or have strength requirement to use the machine. You can be on any muscular skill level and still reap the benefits of an elliptical trainer. This is what makes an elliptical trainer a versatile workout machine for all body types and age groups. You can have one Elliptical trainer in your home and it can be used by your entire household to maintain a strong fitness level for everyone in your home. A Elliptical trainer can help you maintain a healthy body by using a simple routine that can fit different age groups and body types. It is no wonder that these machines are becoming very popular and are in high demand. An elliptical trainer has many benefits that will cater to any of us while also helping us lead healthier lives through daily exercise. 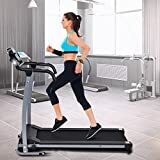 Get High End Home Fitness at an Incredible Price with the Sole F80 Treadmill Interestingly, the Soles folding treadmill frame design for the F80 originated from the demand of hotels for a treadmill that was as mobile as a room service cart, yet still stable and powerful. Today, apart from its innovative design and mobility, the F80 is reputed for its outstanding quality and value. The F80 treadmill remarkably steps up to expectations performing on par with other more expensive commercial brands at a fraction of the price! 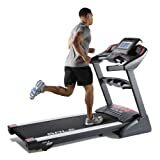 Featuring Soles unique Cushion Flex Whisper Deck, the sturdy steel-welded treadmill delivers health-club quality workouts and reduces impact up to 40% compared to running on asphalt, so you can train safer and harder. Its powerful 3 horsepower continuous duty motor delivers challenging speeds up to 12 mph and inclines up to 15% for more intense workouts. Theres also a 1/4 mile track feature and a Peak and Valle. The Sole F80 treadmill has earned a reputation as one of the highest-quality treadmills in its price range, with an unbeatable combination of high-quality components and user-friendliness. Sole took the F80 to the next level in 2011, however, adding a longer deck, a better display, and a fresh new look. The changes make the treadmill a great choice for moderate to athletic runners who don’t want to spend several thousands of dollars but still want a powerful, tough machine. All Sole treadmills are outfitted with powder-coated, all-steel welded frames and heavy-duty, stable inclines. The F80 also includes an industrial-quality 3.0-horsepower continuous-duty motor and all-steel zinc-coated balanced flywheel, creating a secure, quiet, vibration-free running/walking surface. The flywheel is much heavier than most other brands, giving runners the fluid motion they’re accustomed to at the gym. To accommodate runners with balky joints, Sole added its low-impact, whisper-quiet Cushion Flex deck. The Cushion Flex system greatly reduces the impact to your feet, ankles, knees, hips, and spine, making it comfortable for frequent runners or for users with running- and walking-related injuries. In a recent study, researchers concluded that the Cushion Flex deck reduced impact up to 40 percent as compared to running on asphalt. The F80 comes complete with two heart-rate-controlled workout options, so you can customize the workout specifically to your needs. Throughout your HR workout, the treadmill will display a heart rate zone graph on the console while adjusting the incline to keep you in your target zone (the treadmill includes a wireless chest strap that touts a 99.9 percent accuracy rating). The remainder of the time, you can challenge yourself with the six automatic programs or two customizable programs. And to reduce space, the F80 boasts an Easy Assist folding deck design. This unique feature allows you to release the deck, step back, and watch the deck unfold itself. When you’re done with your workout, simply fold it back up and store it out of the way. Other features include cooling fans, a large stop switch, armrest speed and incline controls, a 20-by-60-inch running bet, and a low-profile running hood.